Notes: As defined here, Western Arnhem Land of the Northern Territory extends beyond the northern and western boundaries of the area formerly known as the 'Arnhem Land Reserve'. To the north it includes the Coburg Peninsula, Croker and Goulburn Islands and the Liverpool River region; to the south, it extends from the west coast to Katherine and further east. 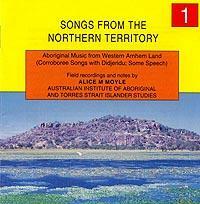 Most of the recordings transferred to disc 1 were made at Oenpelli, north of Kakadu National Park. The remainder are from Bagot, near Darwin. White settlements were established at isolated places in Western Arnhem Land in the early years of the nineteenth century, increasing rapidly after 1872, the year Darwin became linked by telegraph with Australian capital cities and Britain. Despite the resulting dispersal and fragmentation of tribes and language groups in this region and ultimate disruptions to ceremonial life, a few song types have persisted, some of which are to be heard on this disc. Associated with spectacular kinds of dancing which were often admired and reported in the writings of early observers, they are accompanied by the didjeridu, a name which seems to have been used first by non-Aboriginal people in the Darwin area. They are still sung by a diminishing number of creative musicians whose presence is sought, over a large area, whenever a corroboree is held. The didjeridu of western Arnhem Land is used as a patterned, bassdrone which-at the time these recordings were made-varied according to song type and to the singer's place of residence. There are many Aboriginal names for this instrument, some of them now losing currency like the languages to which they belong. In the Oenpelli region the Aboriginal name for didjeridu is magu; among groups in Darwin and surrounding districts, it is kanbi and kanbak. Singers heard here represent the following language groups: Gunwinggu, Gunbalang and Djawan (tracks 1-6); also Yiwadja, and some of the smaller groups traditionally located south of the Daly River which were referred to collectively in the 1960s, as Wagatj (tracks 7-13). In Gunwinggu, a dance song is borg or gunborg, in the Daly River languages, it is wongga, also spelt wangga. Western Arnhem Land singers either inherit their songs from their fathers and older male relatives, or they 'find' them for themselves in dreams. Dreamed songs are believed to be communicated in this way by the spirit of a deceased singer. Whatever their believed origin, these songs are usually similar, stylistically, to others in the vicinity. Characteristic of Western Arnhem Land dance songs is a comparatively wide vocal range of pitch (approximating sevenths, octaves, even twelfths) within which there are 'tiled' or overlapping descending passages many of them resembling scales or modes. A Western Arnhem Land singer prefers to select the pitch of his didjeridu accompaniment to match his song. A player, therefore, may have more than one instrument lying near at hand. Dance songs in this region almost invariably begin with the droning sound of the didjeridu to which the singer then adapts the range of his song's melody. The usual order of entry of the sound components into a Western Arnhem Land dance item is therefore: didjeridu first, then the singer's stick beats and finally the singer's voice. At the end of the same song item, final stick beats synchronise with calls and shouts from the dancers. Also characteristic of this musical region is the behaviour of the onlookers who clap their hands in time with the singer's stick beats and shout with approval (oi!) when the item finishes. In Western Arnhem Land, the melodic lines or contours are divided into sections. Within each section there may be contour variations, but each one follows a descending path towards the pitch of the drone. During the breaks between the sections in the vocal part, the didjeridu and stick beating continue their binding web of sounds. The singers themselves do not always know the meaning of the words they sing and many of their song utterances appear to be little more than syllabic patterns with intervening glides. That there are exceptions, however, is demonstrated by the sample on this disc of Gunbalang singing (track 6a), song words of which are to found transcribed and translated below. 01 Excerpts From Wild Onion Corroboree 0:05:41 Oenpelli 1962. Sung by Djimonggur and Nangmandualawogwog with Malaibuma (didjeridu). The Wild Onion dance was performed in season (June). Fruit was ripening and leaves were drying. In one of a number of short acts the dancers mimed the digging up of the onion and puffing it in a dilly bag, a task normally carried out by Aboriginal women. The dancers' contributions to the recording include shouts and a hissing sound (ss-w). The singers of Wild Onion (mandane') are two Djawan men (Nim Djimonggur (b. 1910) and Fred Nangmandualawogwog) who belonged to a locality further south, near Katherine. The song was 'found in dream' by Nim who, before its discovery, had not been a singer of any standing. Nim's dreaming of Wild Onion enabled him to become arabadba which, at Oenpelli, means songman, or a man with a song of his own. Before the last item there is a sustained call. While performing on the dance or corroboree ground, with his assistant singer and associated didjeridu player, Nim wore an object representing the wild onion, or 'cheeky yam' suspended on a string round his neck. His headdress, incorporating turkey feathers, signified the leaves of the yam plant. 02 Excerpts From Blue Tongue Corroboree 0:06:01 Oenpelli 1962. Sung by Yinmalagara and Nalbared with Djawida (didjeridu). The sustained call, heralding the conclusion of the performance, may be heard again here just before the commencement of the last Blue Tongue item. This final tune, which identifies the series, was known at Oenpelli as the manbadjan (mother, or 'big one'). The singers Nalbered (b. 1922) and Yinmalagara, provide stick-beating accompaniment at two different speeds, one pair beating in doubles (quavers) and the other in singles (crotchets). 03 Didjeridu Only By Djawida 0:01:42 Oenpelli 1962. Didjeridu by: Djawida. The Gunwinggu name for the didjeridu is magu (pronounced magaw). The didieridu-dideru sound patterning in the demonstration by a young Gunwinggu player, Djawida (b. 1943), suggests how the instrument may have acquired its more widely-used name. 04 Indjalarrgu 0:04:43 Oenpelli 1962. Sung by Nambadambal and Nadjalbur with Wandiwandi (didjeridu). Indjalarrgu items about spirit children or 'mermaids', sung by Nambadambal (b. 1940) and Nadjalbur, were said to have been dreamed by a Maung (language) man on South Goulburn Island. Related to conception and birth, Aboriginal beliefs about pre-existent spirit children are widespread. The lndjalarrgu items sung by these two Gunwinggu men, are divided into melodic sections ending with long passages for didjeridu and song sticks. The song words or syllabic sounds are often slurred and have not been transcribed. 05 Gananggu Speaks About Songs And Didjeridu Accompaniments in English And Gunwinggu 0:01:32 Oenpelli 1962. Frank Gananggu talks briefly in English about some of the songs; and in Gunwinggu about their associated didjeridu accompaniments. A free translation of his Gunwinggu comments is as follows: In the didjeridu accompaniment for Blue Tongue Lizard songs, the player says: didjemro, didjemro, etc. For Wild Onion he does the same. In Yam, Gunbalang and other songs he says: didjeramo-rebo, didjeramo-rebo, etc. And there is another slower accompaniment in which he says ... etc. (d) Maralngurra gives place names at Oenpelli 0:03:59 Oenpelli 1962. Didjeridu by: Lamilami. (a): The inaugurator of the song called Gunbalang was said to be Bob Balirbalir, a Gunbalang speaker and brother of the present singer, Bilinyarra (b. 1920). These 'Gossip' songs refer to an affair in an indirect way, without mentioning the names of the man and woman involved. See song words and translation below. With its fast, ternary rhythm and whirring didjeridu accompaniment, Gunbalang conveys a feeling of suppressed excitement. Short, barely perceptible breaks in the didjeridu continuum occur in the second, fourth and final sections where the accompanying instruments are heard without the voice. Notable is the rhythmic 'trip', or accented rhythmic alteration, which occurs at the termination. Onlookers provide a hand-clapping accompaniment and the final Oi! ; (b): The Gunbalang accompaniment played here by the expert Maung player, Lamilami (b. 1913), is based on the didjeramo-rebo pattern; (c): The song-words for Gunbalang are here spoken by the singer, Bilinyarra. There are close similarities between Bilinyarra's spoken song words and those transcribed for a 'Sweetheart Song' (No 29) in RM Berndt and CH Berndt, Sexual Behaviour in Western Arnhem Land (1951, 223); (d) The voice of Silas Maralngurra, a Gunwinggu man speaking in English, may be heard pronouncing the original name of Oenpelli (Gunbalanya). He also gives the names of three hills in the locality. 07 Djunggurin 0:03:47 Oenpelli 1962. Sung by Nabadayal with Malaibuma (didjeridu). The singer, Lofty Nabadayal (b. 1920), a Gundangbon (Dangbon) speaker who belongs to a territory south-east of Oenpelli, learnt this song from Wagatj men at Belyuen. Called Djunggurin at Oenpelli, it would be known among the Wagatj as Wongga. The singer's slow descending cry, sometimes incorporated as part of the dance music, was characteristic of Western Arnhem Land Wongga singing at the time. These dance songs were usually heard in camp either as musical entertainment or with dancing during ceremonies. The didjeridu is played by David Malaibuma (b. 1938), a Gunwinggu speaker who accompanies the Wild Onion corroboree (Track 1). In rhythmic style and tempo his Djunggurin accompaniment is not unlike that of a drum played in a military march. During the performance which took place at the time of recording, dance steps were in time with the one-two-threestop pattern of the didjeridu rhythm and the singer's sticks. Carrying large handkerchiefs, said to be 'for balance', the Djunggurin dancers advanced and retreated in a line. The growl-shout and other formal responses heard during dancing are familiar Wongga features. Added to these is the quick-tapping figure suddenly introduced into the leading singer's stick beats to announce that the final item in his performance is approaching. 08 Djambidj 0:01:51 Oenpelli 1962. Sung by Burralang with Bilinyarra (didjeridu). The samples called Djambidj (Morning Star) sung by Burralang (b. 1939) and brought to Oenpelli by Burera singers from further east in north Arnhem Land, belong to a special ceremony of this name which would be performed at times of death or mourning. The slow detached sounds of the didjeridu, like the tolling of a large bell, and the stickbeating in quick even beats, are indicative of ceremonial song items from north-eastern Arnhem Land. Although out of place in a collection of samples of Western Arnhem Land singing, this excerpt demonstrates that regional differences may sometimes be observed in songs performed at the same place. 09 Gurula From Cape Don 0:02:32 Darwin 1962. sung by Yambitjbitj with Sam (didjeridu). The items of Track 9, said to be about 'sea-birds and the sea', belong to an order of songs known at Bagot as Gurula. The recorded performance took place at a small family gathering round a camp fire. The singer Brian Yambitjbitj (b. 1946), appeared to be practising under the watchful eye of Ilarri, a senior Yiwadja man from Cape Don, Coburg Peninsula. A Gurula series is usually accompanied by two pairs of song sticks, one singer beating in doubles, the other in single (compare Blue Tongue). Against this complex of clicking sticks the didjeridu alone is heard in relatively free, but accented sound patterns which apparently make use of two closely-adjacent pitches. 10 Two Songs From Belyuen 0:05:17 Darwin 1962. Sung by Bobby Lane with John Scroggi (didjeridu). In Track 10, words for the two songs from Belyuen are announced at the conclusion of each item by the Wagatj singer, Bobby Lane (b. 1940). No translation was offered. (b) Didjeridu only 0:02:59 Darwin 1962. Sung by Bill Manji with Alan Nama (didjeridu). Notable in the song from Anson Bay (Track 11a) is the penetrating voice of Billy Manji (b. 1934), a young singer of the Brinken-Wagatj language group. There is vocalising on vowel sounds (a, ey, i) and detached sounds such as di-di-di occur regularly as a refrain. Characteristic pauses in the didjeridu part are demonstrated (Track 11b) by Alan Nama (b. 1934), a player well practised in Wongga accompaniments of this kind. 12 Brinken Fire Song 0:01:36 Darwin 1962. Sung by Wuniya with Bultja (didjeridu). The Brinken Wongga in Track 12, sung by Peter Wuniya (b. 1920) is about a bush fire; the meaning given was 'they see the fire and run' (to the water). (b) Muluk, 'Prince of Wales', Mudbul with Tommy (didjeridu) 0:03:01 Darwin 1962. Didjeridu by: James (12 years old) and Tommy. The Wongga about a buffalo hunt, reproduced in Track 13a, was sung by a group of young boys from Belyuen Settlement School. The didjeridu player, James, was twelve years old at the time. The boys had been coached by the Manda-Wagatj owner of the song, Jimmy Muluk (b. 1925), who leads the adult performance in Track 13b.